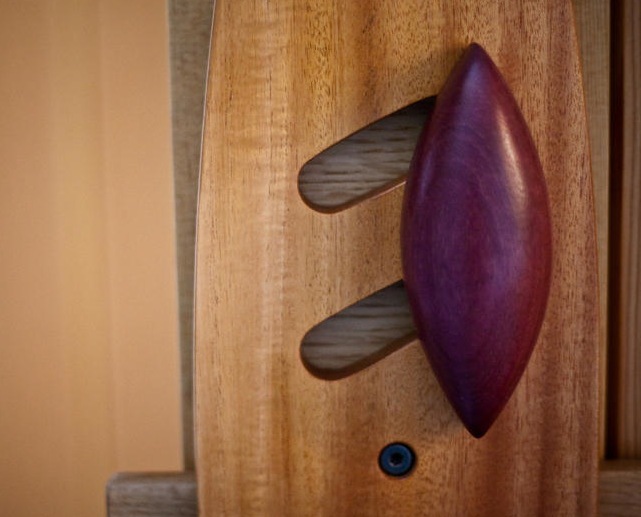 The commission for this door actually fell into the lap of a good friend of mine who is also a talented furniture maker. 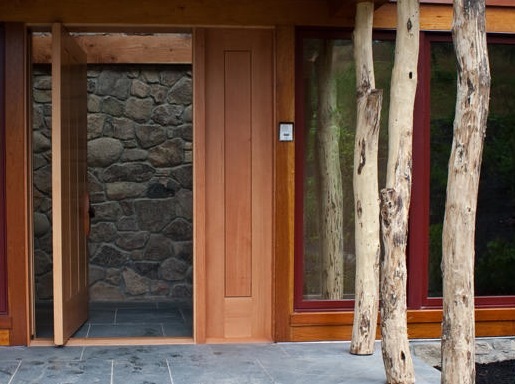 When he initially mentioned the job to me and inquired if I would be interested in designing and building the unit together, I could barely restrain my excitement. I knew from the beginning that it would be a challenge to design and fabricate this one of a kind piece, but I also realized that the final product would be well worth the work. 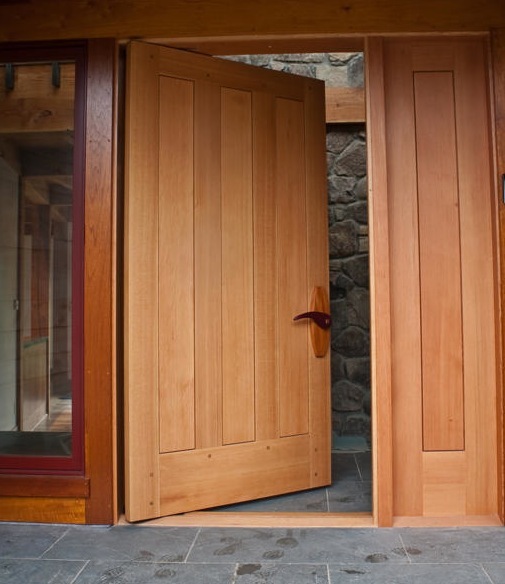 Essentially, the commission was for a large front door which opened and closed on a pivot hinge which would be inset 12″ inside the door frame. The tricky part, however, was that the customer also wanted all of the hardware (minus the actual hidden pivot hinge) to be made out of wood. So, after spending many hours together designing both elements, my good friend set out building the door and I took the job of fabricating the various hardware elements. 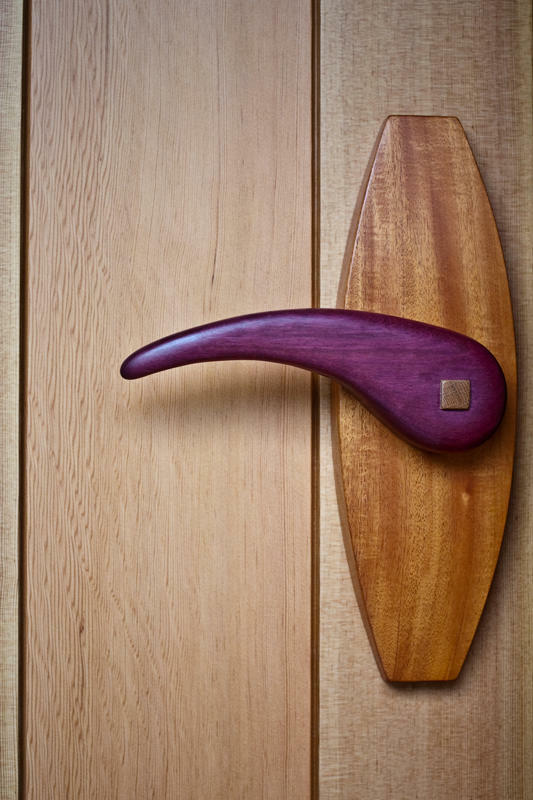 Purpleheart was chosen for both the inside and outside handles due in equal parts to its strength, durability when exposed to the elements, and its striking beauty. 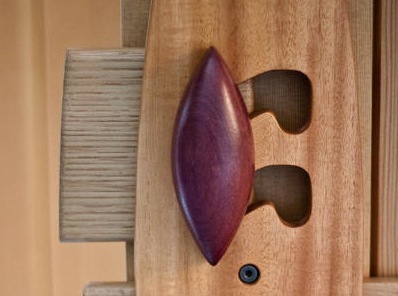 Both handles were hand carved from a single block of wood and shaped to their final contours with the use of hand files. 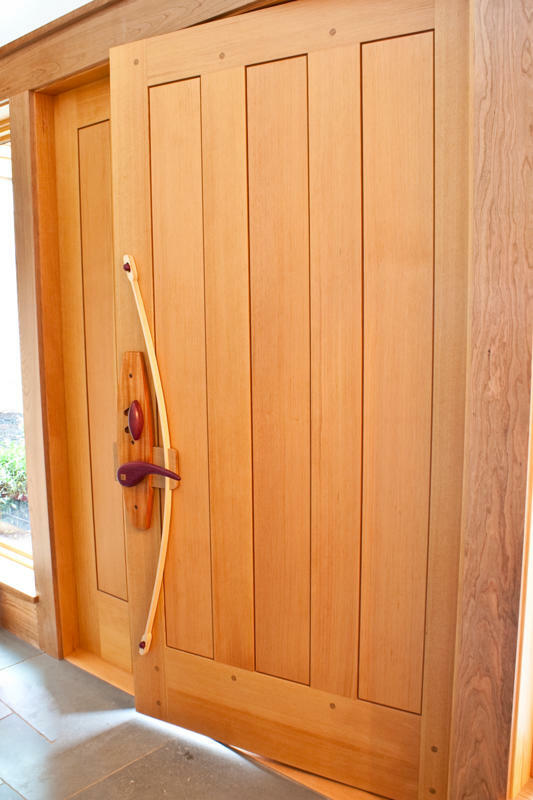 A 3/4″ square White Oak dowel passes all the way through both handles, tying them together from either side of the door. Loosening a set screw in the bottom of the interior handle allows it to be removed should the unit ever need to be disassembled. Both handles rest on top of contoured plates made of solid Honduran Mahogany, another wood renowned for its durability when used outside. 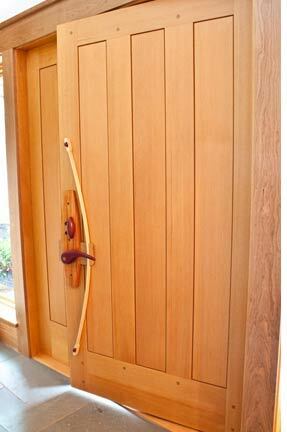 The interior plate is grooved out on the top and bottom to allow for the sliding action of the dead bolt and main throw. 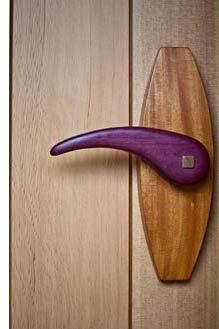 The dead bolt itself has a solid, hand carved Purpleheart handle which fits perfectly in your palm. Its doweled White Oak body slides on a double track, allowing for a lifetime of smooth operation. 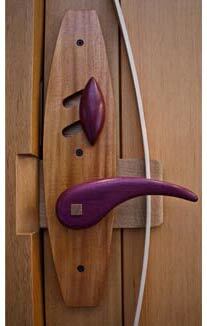 Various shots of the door latch and hand carving. The main throw is, perhaps, the most remarkable part of the whole hardware assembly. 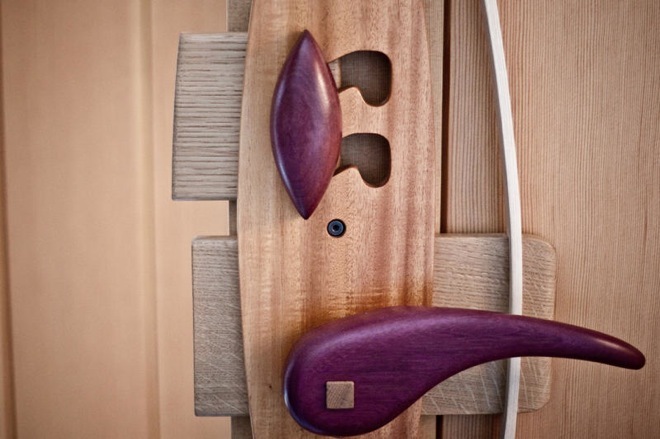 Again made of White Oak, it has a dadoed groove through which passes a long “bow” made of Ash. 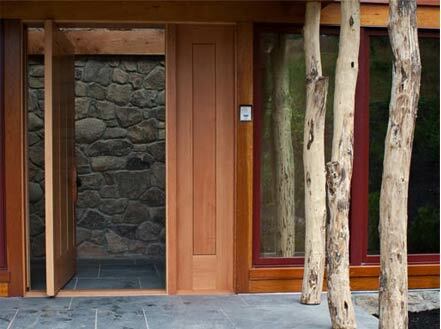 Ash is known to have a wonderful ability to retain its springiness, so it was the ideal choice for this element. 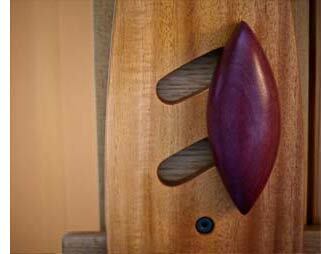 When the handle is turned, the throw moves to the right, thus increasing the already present tension on the Ash bow. 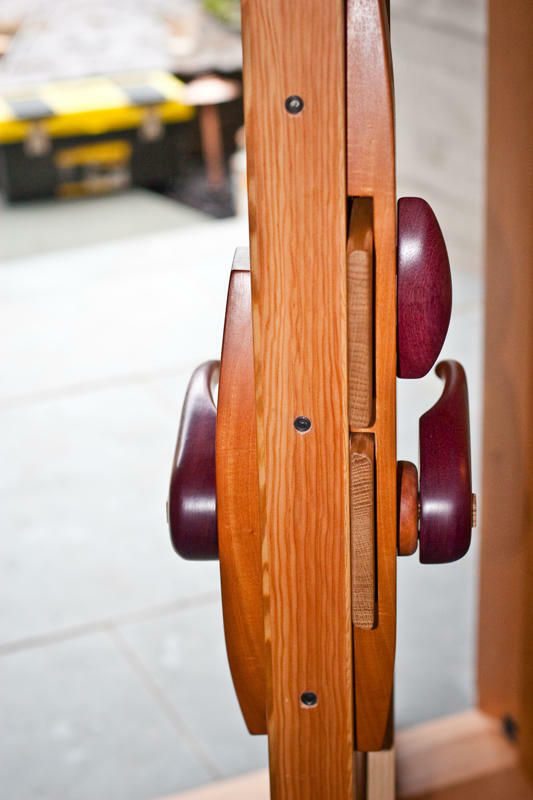 When the handle is released, the added tension causes the bow to act as a spring, pushing the throw back toward the door jamb and latching the door closed. 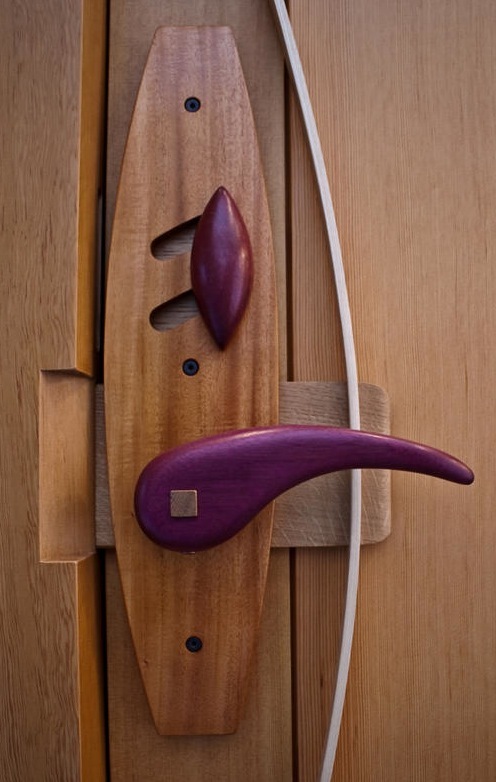 The bow has a 3/8″ wide slot at both ends which ride on Honduran Mahogany dowels with rounded Purpleheart caps. 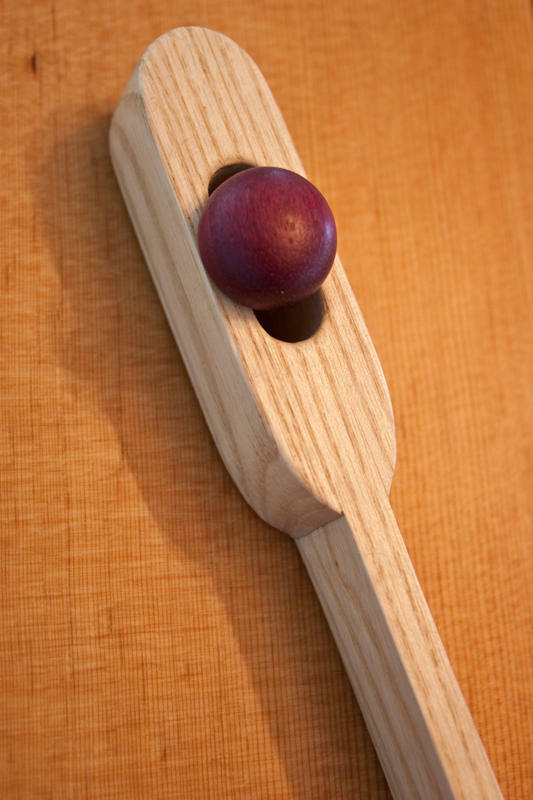 Initially I was concerned with how the handle assembly would function long term due to its wooden parts needing to be waxed to prevent friction. However, through the use of concealed ball bearing guides, the unit now functions just as smoothly as a metal lock system and will continue to do so indefinitely. All in all, the project was a tremendous success. The only problem is, now I want one at my house.